What Exactly is a ‘Couture Technique’? Do you use the term ‘couture technique’? I’ve never really used it – in fact, I’m not exactly sure what one is! From blog reading and library books I have a general idea, but I am hesitant to use the term without knowing what the true definition is – and is there one? These are my random thoughts and questions on the subject – they are not necessarily my opinion. I’m really interested in your thoughts, and hearing what you understand a ‘couture technique’ to be. The French word ‘couture’ translates into English as ‘sewing’, so is a couture technique simply a sewing technique? Why then are couture techniques considered in higher regard than ‘ordinary’ sewing techniques? In the French Haute Couture system much is sewn by hand – does this mean a couture technique is one that is only sewn by hand? I’m not sure this is correct, as a quick glance at several couture technique sewing books (like the ones above!) reveals that a lot is done by machine, and some techniques are very basic. Is any technique used in Haute Couture a ‘couture technique’ – including sewing on a button? Is a couture technique used only in custom made or made to measure garments? When I designed custom bridal, I altered my usual construction order so fittings and adjustments could be more easily made, and due to the nature of the garments I underlined more, used more boning, horsehair and net, and with all that lace and beading there was definitely more hand-sewing! But does that make all these techniques couture, when a ready-to-wear gown could be made in much the same way? Is a couture technique the ‘best‘ method? I personally think that there are many ‘best methods’ rather than a single one – and a good designer will have a wide variety of techniques in their arsenal and choose the most appropriate for a particular situation. Sometimes the best method for a hem might be a blind herringbone stitch, sometimes it might be just gluing it! Is a couture technique an advanced technique? If so, at what point does a technique become advanced? Who decides this? Is a couture technique one used when time is no object? In other words, cost is no object too! Is it simply a case of sticking a French word in front to appeal to our inner snob. Sort of like saying ‘faux leather’, when fake leather will do. Maybe it is a handy marketing ploy to imply prestige, sell more product, fancy tools, or books on secret sewing methods? I seem to come across the term mostly in an American context – is ‘couture technique’ an American term, and not really used elsewhere in the world? These are all thoughts I’ve had as I try to come to a definition, and I’m really interested to hear your opinions! What is it that really separates a couture technique from an ordinary sewing technique? What exactly does the term mean to you? Oh you might be ruffling a few feathers with this one. Personally I take the literal translation of couture as 'sewing' but haute couture is attention to detail and yes, spending time (lots of time) on hand sewing and finishing techniques. Haute couture requires underlinings, facings, seam finishes, bound button holes, matching stripes and checks and of course, using the very best of pure natural fabrics like silk, linen and wool. Then it automatically becomes expensive. Ooh I hope I don't ruffle feathers because that is not my aim! I respect anyone who aspires to higher things in their sewing. My translation sounds similar to yours Ruth, but I get confused where the overlap occurs – a lot of these techniques are found in ready-to-wear as well! I'm in the Uk and Couture is normally used to mean high end designer (as opposed to ready to wear). to me, couture sewing techniques would mean lots of attention to detail, finishing and fit. the idea of made-to-measure. so i would guess what most home sewists do on a regular basis (well i'm a beginner but I'm working on it!). You've raised some interesting points. For me, as self-taught hobbyist, couture means techniques used by professionals to produce high end custom garments.. The word is used now to market to sewers like me who want to make their garments better than RTW. I really want to thank you for this post. I love the idea of what “Haute Couture” has come to mean here in America. Which is quality attained with time and attention to detail. Knits are almost never considered to be in this category. And I like knits. But I learned to sew so I could make things in not knit. I also like alliteration. There are some out there in the blogosphere that have made it sound like, if you didn't go the Nth degree then your garment is somehow lessened or beneath wearing. But that might be me bristling due to my own perfectionism battling with my impatience. So, thank you. I think its OK to make a garment that is looks just fine and makes you feel good even if you DID use the serger for the three thread rolled hem. …that in Europe where they still have guilds to designate quality of craftsmanship “haute couture” only goes to a select few design houses, such as Dior, and only for their made to measure couture line. Garments only a select few individuals can afford to wear and own. In America we don't have these classifications or for that matter the apprentice system that supports and protects it. To me it represents sewing as a serious art form that is dependent on fit and function. It encompasses old and new techniques perfectly executed to create the designers vision. It calls upon a vast store of knowledge and experience to apply the correct techniques in the right circumstances. There are great artists(Rembrandt) and there are artists(local fair art), haute couture is a label which represents the former. All of us can apply couture techniques in our garments but very few us will acquire the skill to be considered couture sewers or for that matter allowed to sew in a couture workroom. Where I live, it is a case of “sticking in a French term to appeal to the inner snob.” And/or custom garment construction — whether or not for a “high end use” — rather than mass production. I really like Lynne's idea that 'couture' is “sewing as a serious art form”. I'd specify “garment sewing”. Interestingly, I just bought the Dressmaker's Handbook (pictured above). I think of couture as hand tailoring (whether that's right or wrong). And about applying a sense of skill to construction. Couture is not always the prettiest interior construction (as I see it), it's the construction that yields the best finished product on wearing. I think, people refer to “couture” as to the shortened version of “haute couture” which has been the latest trend in the world of home sewers and bloggers. I translate it as “applying professional sewing techniques in the home sewing”. Maybe not all people know that “Haute couture” is a trade name given by the Chambre Syndicale de la Haute Couture to only some “maisons” that match high standards of garment execution. Haute couture is Rolls-Royce of the sewing universe, is a marriage of custom fit for a particular client, expensive (ans very often made to order) fabric and, of course, high quality techniques and craftsmanship. Every single piece of clothes is UNIQUE. Using couture techniques to me means alternating machine sewing with hand sewing to achieve greater results. I agree with Lynn, applying “couture” techniques won't make us “la petite main” = hand worker who executes the garment sewing in the atelier. Also as a full-time employee I can't afford the luxury of sewing garment entirely by hand. But it's great to know many different techniques and apply them when necessary. Prior to a few popular fashion oriented tv programs, such as Project Runway and Queer Eye for the Straight Guy, I am certain that few Americans even knew the word “couture.” I tend to think that the phrase “couture sewing” is recent and that it results from the DIY phenomena in combination with the popularity of Project Runway. (My grandmother certainly used some of the techniques and never called it couture!) Haute Couture is one thing — custom made with painstaking care + best materials –- and absolute individualized fit is a primary objective of that fashion category. I don't think that there is a clear understanding of this in the U.S. There seems to be a prevalent notion that something like an (ordinary) handstitched hem is “couture.” “Couture sewing” seems to be applied to anything that is beyond intermediate level and virtually all hand sewing– incorrectly, in my mind. I think I generally see “couture” used (in English) as short for “Haute couture.” My impression of haute couture comes from an interview I read on Pattern Review at one point given by a woman who worked in a high-end, haute-couture shop (atelier, speaking of inserting French words for the fancy value)—the techniques she describes were custom-made garments, a lot of hand work. Only straight seams were ever sewn by machine, everything else from buttonholes to setting sleeves to hemming, was done by hand. Interestingly, there seemed to be less emphasis on pattern making, more on draping, maybe because that makes more sense in the context of individual and unique garments. Anyway, it was a very different approach to sewing, and the garments produced would cost thousands of dollars. It seemed more about the tradition and prestige and creating fine garments than about efficiency. I think a lot of the books marketed as “couture” sewing aim to help us hobbyists add a touch of this couture style—even if it's just careful construction—without having to go whole-hog, since (almost) none of us really want to do that much hand sewing. So yes, I'd agree that a lot of it is marketing gimmick. I do find the tendency of English-speakers to insert a French word to make something sound more classy (everything from chef to couture to cafe to salon) is pretty amusing. And often the English meaning of these loan-words is quite a bit different than the French. To me, a couture technique is one that is generally NOT often seen in manufactured RTW but IS used in custom made clothing, (as well as Haute Couture – which is also custom made.) Examples – bound buttonholes, hand-inserted linings, hand sewn buttonholes, hand-inserted zippers, hand-sewn embellishments like trims, appliques, hand-rolled hems. Lots of hand sewing! lol. I think it's thrown around a lot to indicate high-quality, but unless you're an expert in those techniques, I don't know that the result is necessarily high quality. Not all *hand-sewn* buttonholes are *couture* quality, even if it is a couture sewing technique. Interesting post and questions, Sherry! I agree that it can be confusing, also because it could also imply the reverse, “not-couture” techniques or styles of sewing, as some have mentioned here. I understand “haute couture” in its strict definition, just as with bespoke, but I also understand how language goes into semantic drift. So now they both are tied to and represent a larger fascination in our society with the handmade, the close-to-the-maker, the authentic, the real (and things that take time to make, as opposed to quick). I once saw a cool little butcher shop that specialized in “Bespoke Sausage!”–and there is a lot of this going on–implying artisanal, traditionally crafted, family-owned traditions. I like poetic use of language so it doesn't bother me…. Anyways, I'm guessing its use has gotten so popular in the last decade or so in sewing culture–and represents the same reason that sewing has gotten so popular–because of a desire to connect with an older tradition, something authentic and artisanal! What it strictly means, though, I'm not sure… one of my recent RTW dresses has beautiful bound buttonholes, which were sewn entirely by machine. I'm sure even tailors are debating what comprises bespoke techniques, what with padstitching machines and all! When we look too hard for a definition, we lose the meaning of a word. An English/French dictionary is the exact wrong place to find meaning and only the first step to getting lost. To me, “couture techniques” mean attention to detail and lovely hand execution, but not every hand-stitched detail is couture. Don't miss the forest for the trees. I agree with what has been said. 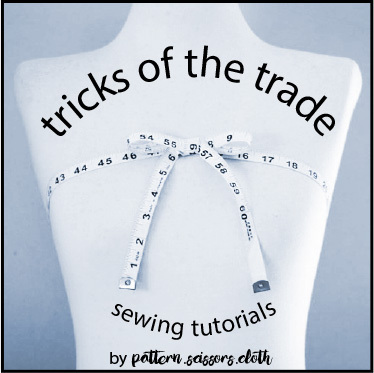 In general, I think that these books use “couture” to suggest that the techniques are more in depth/time consuming and yield better results that what the Big 4 would generally instruct you to do in their pattern instructions. I think of “couture” (as opposed to “sewing”) as “being willing to go the extra mile” to achieve a particular effect or a higher-end, more finished result. Easy enought to slap something together with the serger, with no extra effort involved other than to make sure all the threads are clipped off (that's “sewing”) and then there's 'couture” (underlining, finished/enclosed edges, handstitching on the hem, etc. The difference between the two is readily apparent upon turning any garment inside out.No judgement is implied (sometimes “sewing' is all a garment needs)but I see “couture” as being what one does when one is making a garment “to last”, or, say, a garment for a special event that is not normally what one would sew and so it draws on additional “skill-sets” and creativity. I've really enjoyed reading all of these responses — thanks for posing this question! Ah, Sherry – one of my favorite pet peeves. The word couture drives me insane – mostly because it appears on blogs that seem to suggest that hand-sewing is somehow better than machine sewing, and spending hours and hours on a simple dress is the way to go. My time is more precious, and rightly or wrongly, I have no patience with this. The word couture bugs me because it has lost any specific meaning. It is over-used. Marketers have turned it into a another word for “extra-fancy-and-rare!”. Same thing with tailoring. Those people who make a business out of giving style advice tell us to get our clothes “tailored” and they mean, “get someone to hem your pants”. Isn't that an alteration? Isn't there a difference between having clothes altered and actual tailoring? But these words have become fuzzy in their meaning. And there is a lively discussion on the words “haute couture” going on over at Fashion Incubator right now complete with tongue in check alternative pronunciation as in “hot cooter”. When I see the term I think “noob” because someone with more experience knows better. If the words “haute couture” or “Couture” with a capital “C” are in the name and it's being applied to factory sewing it's all hype. As they say in Texas, “Big hat, no cattle”. To me couture sewing and techniques mean choosing the best/most appropriate method of sewing a certain garment so that the end result is perfect and what is expected, meaning that if I want something to look crisp,simple and puristic I would choose methods of sewing to make that happen for the cloth. Haute couture to me means one of a kind things ( unless two people or more want the same thing) made by hand, it can be made by other source than a french or italian fashion house, as long as it is made into perfection and done by hand. Carson Kressley did make couture a household phenomenon but what he referred as couture was actually just normal RTW, oh! I liked watching those boys….. and BTW you have a very nice blog and you make lovely clothes. You're right. “couture” is an elusive term. Manufactured, i believe, to make us feel that we are not in the upper eschelons of sewing. To me, it means expensive. Or, to put it simply, it means “not for me”. I think those of us who sew tend to be down-to-earth. I'm glad you posted this! I think 'couture' basically means nothing at all. People just use it as shorthand for 'I was careful about this', a sort of brand name. It does annoy me the way the word is thrown around on sewing blogs. I can see why – to get away from the stigma of home-made, and compare dressmaking at home to the super-expensive couture garments sent down the runway. Clothes you see on the high-street are made with processes and machines not possible for the home-sewer, so we reach for a more flattering comparison. But the amazing thing about couture (which I've heard is actually a loss-leader for designers, despite the stupendous price tags) is the stunning designs, not just the sewing skills they use. I think we need to define home-sewing as a totally different thing from both high-street clothing and super-fancy couture designer wear. We can use techniques from both, but ultimately it's a different thing and we shouldn't be ashamed of making our own clothes. Hm. I suppose the meaning changes with the times? When I worked for a small custom-made clothing company, my boss and I talked about this all the time. We made one-off garments that were custom fit to each client… as in each client has their own pattern. We sketched the a design a client wanted based on their description of photo reference, and then made a pattern for it. We called it couture sometimes when marketing, and we used professional finishing techniques, as well as some pretty unique designs, but we could never decide whether it was “Couture” or not. We decided that it is basically a buzz word. Couture = hand finishes. Couture = sewn by Sherrie. I believe what you do and your tricks of the trade fall under the term Haute Couture. To me couture means tailored garments that are fitted on you and have all the little details that make them fit better on the person. In a way it also equals more advanced garments no matter if they are sewn by hand or not. Whatever the decision is I am interested in all of this. Hi, Sherry! I think it is very simple: a couture technique is used to make a couture garment. Claire Shaeffer gives a great overview what a couture garment is. Semantics are less important: 'haute couture' is a protected term, so 'couture' has become a relative equivalent (not only in English). Of course, it is overused, especially when mass produced garments are branded as couture. But, as you know, there is more and more information available nowadays, so an informed sewer (or sewist, or even a customer) can educate him- or herself. From the books, you have mentioned, Claire Shaeffer is the most reliable resource for couture techniques – she researched and described authentic haute couture garments there (and a few high-end RTW). No snobbery, just facts. Are couture techniques the best way to do something? In my opinion, couture techniques exist in context and are the best way to do something in combination with a whole range of other factors. Is quilting a lining to jacket fabric the best method to construct a Chanel-inspired jacket? Yes, if we work with bouclé – the method helps keep it light and flexible and durable, while fusible would stiffen it. So quilting is the best method in this context, but completely useless with a different fabric. And if you have time and money and can charge your customers for it, why not using it in RTW. Marc Jacobs does it – his high-end strapless dresses include a corselet foundation and waist stay, for example. But then, the dress costs accordingly and still fits only a standard size. What is often overlooked, I think, is that there are no real rules, or universal techniques, in couture. Tools, notions, stitches remain the same, but techniques are usually adapted! I just made a high-waisted skirt with boned facing, but the way I constructed the facing works for that skirt, that fabric and the body I have. If these factors change, the engineering of the same garment or its construction may change too. To me the term is overused and meant to appeal to snob value . In reallity it is a French term for sewing and to me this means sewing a garment going the extra miles to get the best finish possible WITHOUT bulk . I have had the opportunity to examine some French Haute Couture when I was in Paris at a famous shop in the Palais Royale run by Didier Ludot. I was really surprised at the LACK of seam finishing etc in these very expensive made to measure garment . What was there, however, was a lightness of construction , interlining and stay tapes etc. which would have made the exterior of the garments hang really well.There was also an editing of seams so that facings were cut onto the garment and so the seam between garment and facing was eliminated. The lack of finishing meant that seams were'nt bulky. I also realized that it is very possible to make very beautiful clothes without any fancy machines save a very good straight stitch . Since then I have often used an old singer with a straight stitch foot and needle plate to get really good stitch quality in chiffon and other delicate fabrics . My computerized wiz bang machine is often left to gather dust . I also really enjoy the tweeking that is possible with hand sewing . To me couture means to sew a custom garment by hand. Thank God for sewing machines!!! BTW love your blog! Couture, or rather haute couture (the creme de la creme), is seen as the knowledge of owning the garment that is ultimately made for you. You will never see this garment on another person. By using techniques (secrets that are highly guarded by fashion industries), the embroidery, appliques and overall silhouette is unique. I sincerely doubt that these high fashion houses are willing to share their techniques for Americans, much less mass-produced books. I love this discussion because I have always had a fascination with high-end garment making. I am reading the book by Claire Schaeffer right now in fact, in which she specifies that the term 'haute couture' is (as mentioned by other posters) a protected term, only given if the design house meets certain criteria; most of which have less to do with how the garment is constructed, and more to do with their practices and locations regarding showing their seasonal collections. Application of the correct techniques in the right circumstances – I agree this really is part of the equation. hehe, those French words you mention are ingrained into English now, just shows how language does change! I think efficiency is a relevant point – the more I think about it the more I think a couture technique doesn't take time/cost into account at all. Yes there is a lot of cross-over, which makes defining a true couture technique tricky! Yes – those brides always seem to lose a couple of kilos in the last week! When I was designing wedding gowns I pondered the same thing! Many do consider it couture, but I felt uncomfortable using the word, preferring custom-fitted instead. hehe Gail – the cheque's in the mail! I like your use of the engineering word Marina, that is exactly what it is like – building a gown on the body! I agree that there is no real rules, just what is most appropriate for the situation, considering all the factors involved. I have been surprised at the basic finishing too, but as you say, it is all for a reason – reduce bulk, seam impressions, etc. The exterior appearance is paramount! Thanks for that thoughtful response Mem and I agree. David Page Coffin also emphasizes the elimination of bulk as a hallmark of quality clothing and in his book on pants he shows the inside of several designer, beautifully tailores pieces and many are not all that “pretty” on the inside, but hang and look beautiful on the outside. I think sometimes home sewists (including myself) can get into a trap of “overworking” the fabric and the seam finishes in an effort to make it look ready to wear on the inside, but sacrificing that seamless appearance. This is one of the reasons I have basically stopped using my serger for most of my “good” clothes. When I sew knits, I still use it but have reduced the number of threads. I'm enamored with hand sewing. Yes, it takes longer but I have so much more control over the fabric, it's portable, and I'm always so please with the way it turns out.